EPL Transfer News. Premier League side West Ham United have announced the signing of former Valencia winger Sofiane Feghouli, according to SkySports. Premier League side West Ham United have announced the signing of former Valencia winger Sofiane Feghouli, according to SkySports. 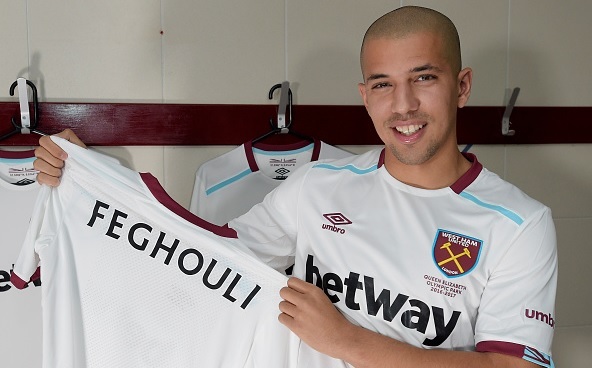 The Hammers have been chasing Feghouli for the past several months and now they have finally sealed the deal. The 26-year-old has signed a three-year-deal and will join the club officially once the transfer window opens next month. Feghouli had been looking for a club as he was out of contract with the Spanish side Valencia after playing six seasons. The Algerian winger told after his deal that he is very happy to sign for the London side. West Ham are already having busy weeks in the transfer market, they have also agreed to sign Borussia Monchengladbach player Havard Nordtveit. Also, manager Slaven Bilic is keeping tabs on Besiktas duo Hutchinson and Gokhan Tore. The Boss confirmed to Turkish media that he is interested in signing them. Feghouli represented France at junior levels before deciding to join his country Algeria's team. Feghouli netted 42 goals in 243 games for Valencia in his six years of stay. Bilic is very happy with his deal and hopes he proves to be a vital player for them next season.